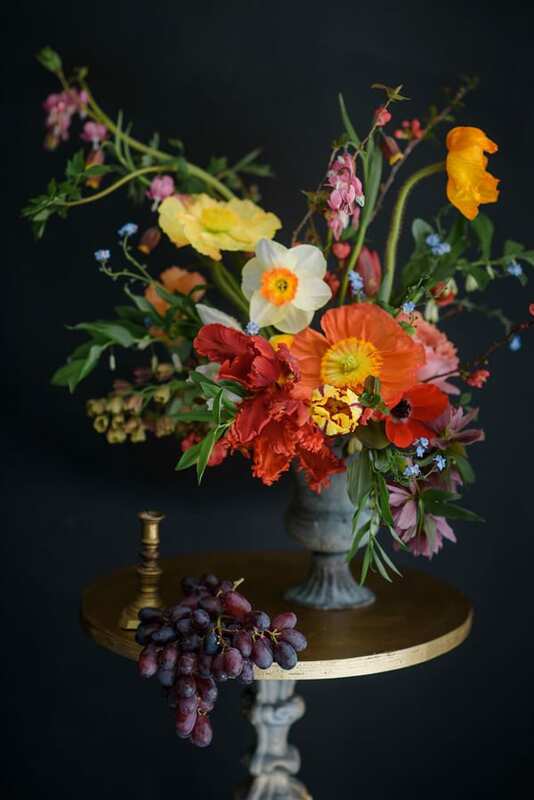 You may remember that back in July, I visited the Jay Archer Floral Design Flower School? 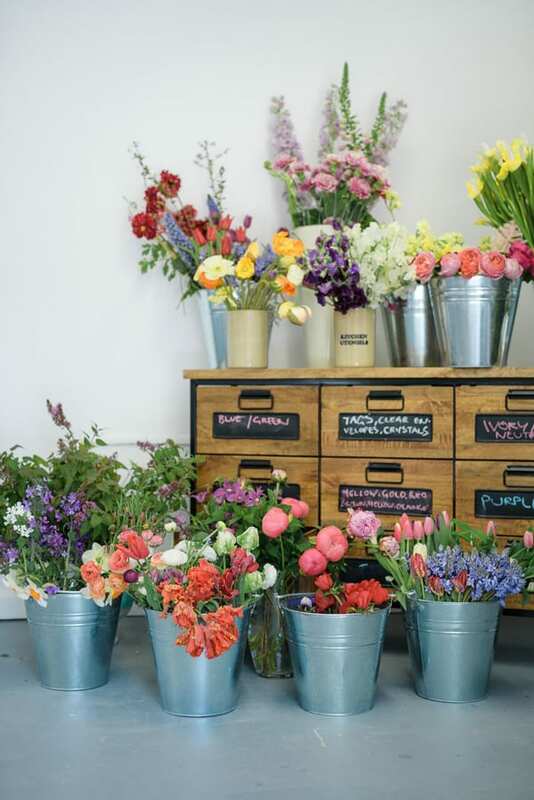 Well, since then, Jay was short-listed for the New Covent Garden Flower Market ‘Florist of the Year 2015’ Awards! 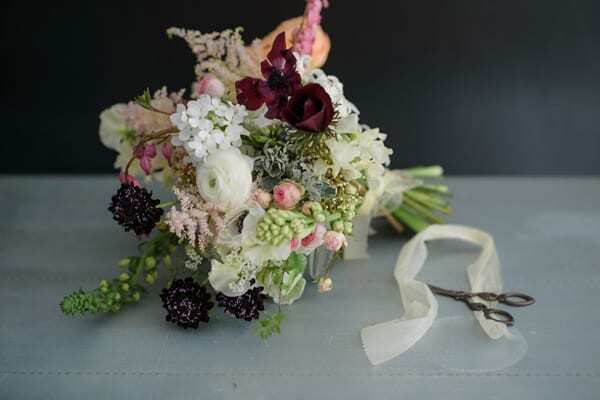 And in today’s Wedding Wednesday blog post, I’m delighted to feature an interview with her about the new Wedding Floristry Career Course, which she’s running next month. 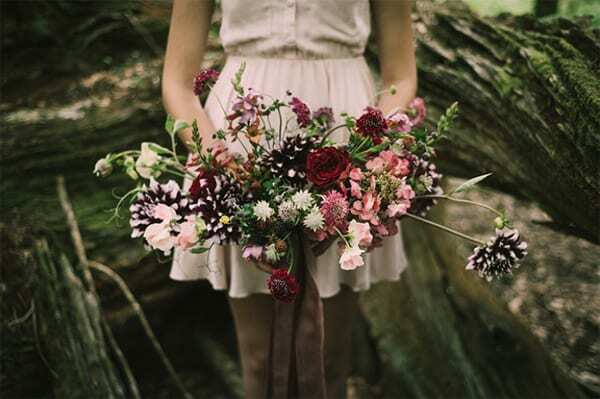 How long have you been a wedding florist? Just over 4 years. The business started officially in Sept 2011 but I did my first wedding a year before that and worked on a few others over that interim year. We’ve worked on over 420 weddings to date. So although we’re a relatively new business, I feel we have a lot to offer. We’ve worked in private marquees of all sizes, private homes, country mansions, art galleries, event spaces, yurts, disused industrial spaces, barns, churches, a cathedral, livery halls and all manor of other venues. So I like to think we know a thing or two! 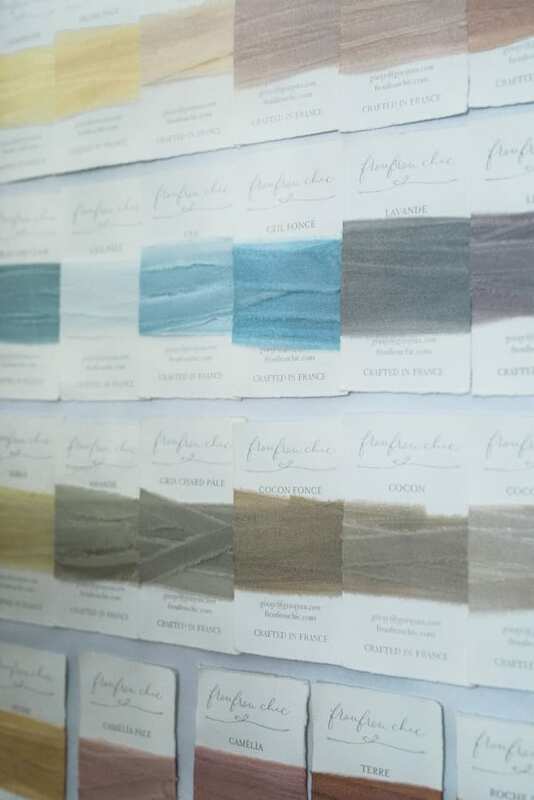 We’ve worked with budgets from £250-£40,000 and often get involved in other aspects of wedding planning, such as working with the client to decide their bridesmaids’ dress colour, linen and crockery colours and venue lighting. It’s this whole process of working with clients from start to finish, of working to budgets and within restrictive spaces that I’d like to share with students. Could you tell us about your design aesthetic? It’s typically ‘English’, textured and natural, and often very loose. I’m not a fan of tight arrangements. I like each flower to be shown off to its best and work to a thought of ‘how would it grow in the garden’ clue, not in 3s/straight lines/tightly packed together! Texture and variety is big for me…a typical Jay Archer Floral Design (JAFD) bridal bouquet will have up to 25 ingredients in it. I’m very much a ‘go big or go home’ florist and the foliage we use is always seasonal, often sourced from our farm. For example, if working with a white palette in the summer, it’ll be complemented with birch foliage. And in the winter with evergreen, coniferous foliage and seed heads. 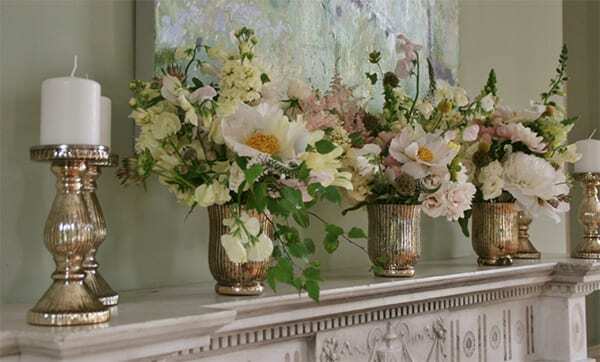 Every wedding and event we do, regardless of the time of year, includes some British flowers and through April-September if not ALL British, our events will have from at least 65% British flowers. I focus primarily on British flowers but make no bones that we sometimes use imported. However my love for British isn’t just the ‘green’ issue. I’ll work with students to explore different options of product with them to develop their own style and the best product available to them for their business, whatever their style. Obviously, I can only teach in my aesthetic but overall the course is very geared towards finding their own ‘look’ and developing this…not copying me! What are the main challenges that you feel wedding florists face? Aside from the actual flowers, the business side of things! Knowing where to pitch their costs and working with clients. There isn’t a simple ‘go to’ resource for people starting out to help them work out their costing, which often leads to frustration from established businesses thinking they’re being undercut. Being more open and honest with each other would help alleviate this. 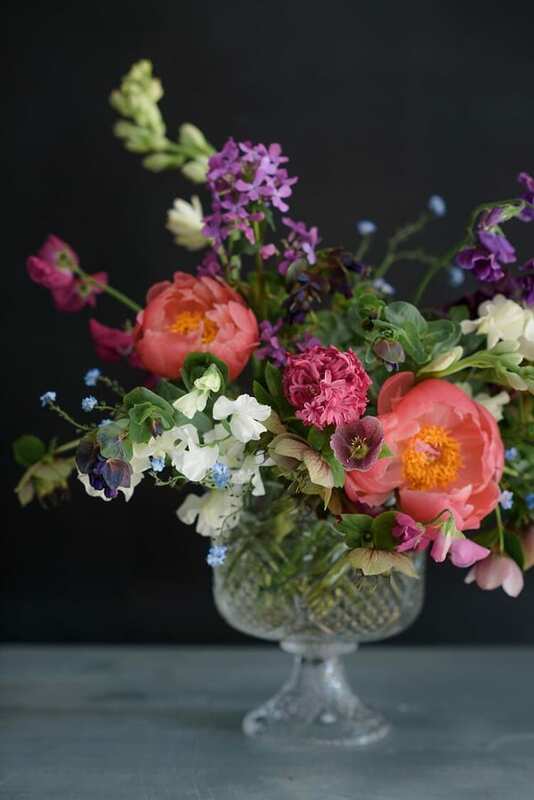 Also, I think that of all aspects of wedding planning, the flowers are seen as the ‘fluffiest’ bit and the bit that, due to many of us being one-woman bands, an area people can see more opportunity to haggle and save costs. Working with clients in a way that educates and ensures they understand what’s involved, as well as attracting the right clients in the first place, is something I’ll be concentrating on heavily in the Career Course. Also, we don’t have a ‘face’ as many wedding florists tend to be workshop based and therefore don’t have shops. I’ll be sharing different methods of increasing visibility of your business alongside advice on more traditional advertising methods. This is a ‘no holds barred’ course and I will be as upfront and open as I can be. We already have a private forum on Facebook which anyone booking onto any of our Career Courses gets added to. And the students are already making use of the document templates shared in there, as well as sharing costing and stem count information with each other. And sometimes just giving each other a gee-up where needed! 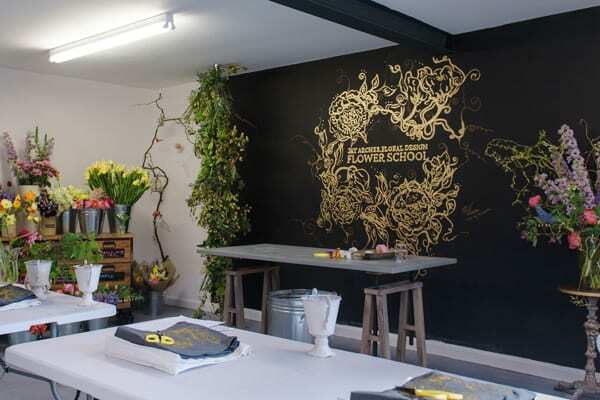 Who is your new Wedding Floristry Career Course suitable for? 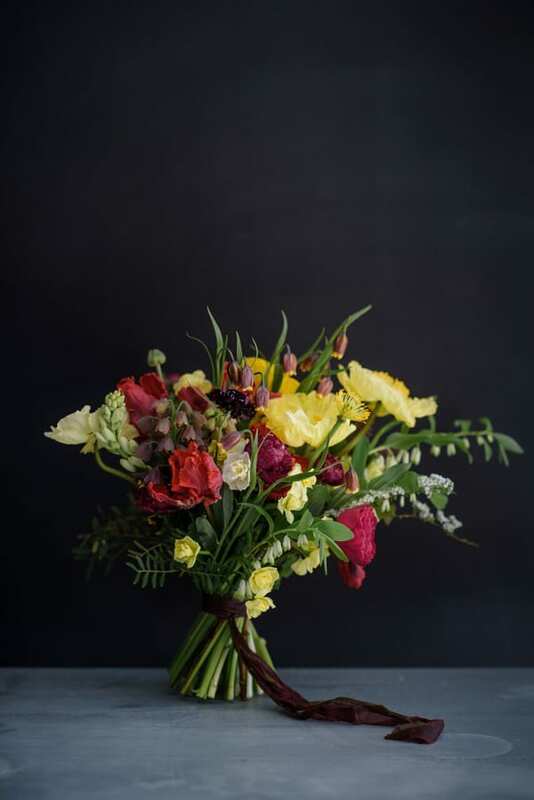 I do ask that people have a basic understanding of floristry already…they can condition, wire and compose a basic arrangement, be it with or without floral foam. However, we cover different construction methods…floral foam vs chicken wire vs freeform…and each arrangement we make, we start from the beginning. So only a basic understanding is required. Anyone who feels they’re not quite there but are considering joining the course can do a 1-2-1 with me prior to the course commencing. We’ll solely be covering the ‘business of weddings’, so we won’t be doing any retail/ funeral/ party work. When and where is the course taking place? 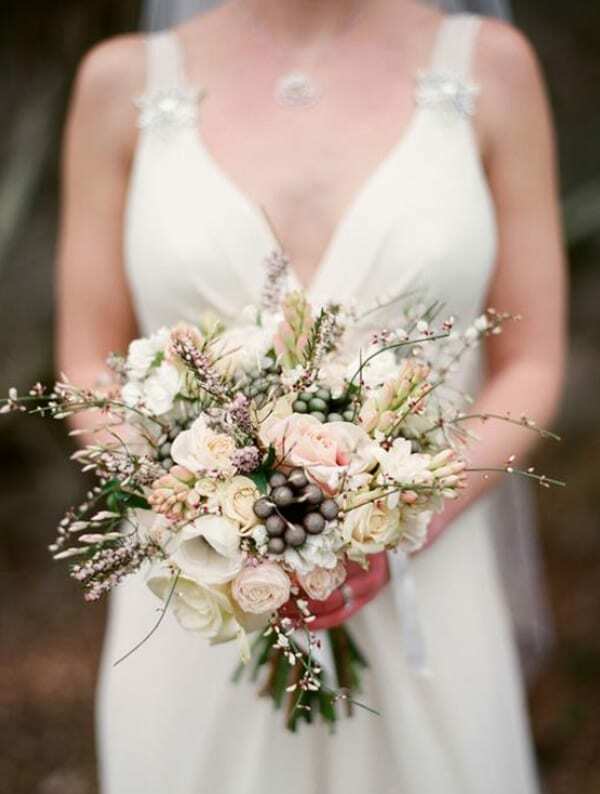 The Wedding Floristry Career Course will start at 8.30am with a meet and greet on Monday, 25th January 2016 at my Hampshire based workshop: Fermoy, Farnham Rd, Odiham, Hook, UK, RG29 1HS. And it will run until approx 4.30pm each day. We’re a 40 minute drive from London on the M3 or A3 and have the local village of Odiham near us. We’re also very close to Hook and Winchfield which have direct trains to London, and Basingstoke and Farnham which are larger towns with good transport links and further accommodation. We’ve negotiated accommodation rates with local suppliers and all our food is provided by Newlyns Farm Shop & Cafe, which is organic and mostly locally sourced, meaning we can cater for all dietary requirements. On the final day, Friday 29th January, we’ll go for a late lunch to say goodbye to everyone! People will be welcome to come back to the workshop with me if they wish and finish off any work. All the students’ work will be photographed professionally by Ria Mishaal for inclusion in their portfolios. Could you give us an overview of the course content? 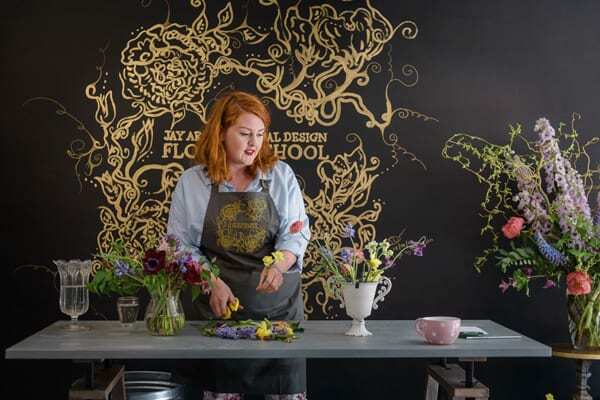 Talk from Claire of Plantpassion, a Guildford based flower grower who grows and supplies many of the flowers that we use at the Jay Archer Floral Design Flower School. She’ll explore the ‘Dutch vs English grown’ debate and offer pointers on growing your own. Lunch – at local pub! NB. Not all students will make every design. Some of larger designs will be made in teams. You’re offering students on-going support for three months after the course. What form does it take? Yes, aside from getting adding to the group, lots of my students already call me for logistics questions and pricing queries which I’m more than happy to help with. I’ll be scheduling a Skype meeting with them all a month after the course to see how they’re getting on with their client proposals/costings and if they have any worries for the year ahead. But they’re welcome to call/email me anytime. 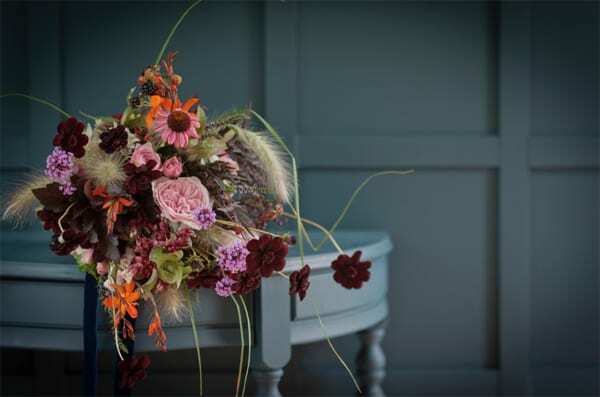 So, if you’re a florist and would like to attend Jay’s Wedding Floristry Career Course, simply visit the Jay Archer Floral Design Flower School website for further details and to secure your place. 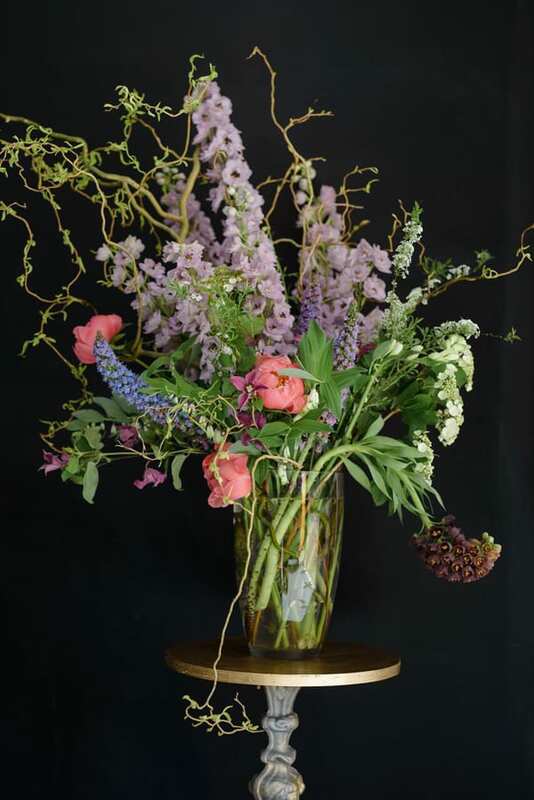 Posted in partnership with Jay Archer Floral Design.